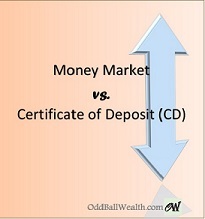 I often here individuals asking what’s the difference between a Money Market Account and a Certificate of Deposit (CD). A Money Market and a CD are both products of a bank or a credit union. They both earn interest and are both federally insured to a set limit amount by the FDIC or NCUSIF depending on whether you get them though a bank or credit union. A money market account (MMA) is an account that normally requires a minimum deposit (it’s a $2000 minimum deposit at my C.U.) in order to open an account and earn interest. Interests rates vary with the market conditions and some banks and credit unions will pay more interest on a money market account with higher balances. Certificate of Deposit (CD) accounts are products of banks and credit unions that are considered investment vehicles. CD’s normally have somewhat better interest rates than Money Market Accounts. When you go to your bank or credit union to open a CD you’ll be agreeing to keep the amount of money in the CD for a certain amount of time, if you withdraw any of the funds before the maturity date you’ll be charged a penalty fee for early withdrawal. The early withdrawal fee is normally a certain percentage of interest that CD has earned. When opening a CD you’ll have different terms of time until maturity to choose from. A CD’s time until maturity generally range from 3-months to 5-years. The longer the term until maturity on a CD the better the interest rate you’ll normally earn. Certificates of Deposits are often used by individuals who have extra money they won’t need for a period of time and want to invest it with little risk, as compared to stocks and bonds that have higher risk. So… What’s best for you? Now that you have the basic’s on Money Market Accounts and Certificates of Deposits you first need to decide if you’ll need your money in the immediate future or not. If you have a lump sum of money just sitting around that you won’t need to touch for a few years then a CD might be a better option than a Money Market Account. If you’re worried you’ll need your money in the near future a Money Market Account might be a better option. At the credit union I go through I use my Money Market Account like a savings account because my interest rates go up with my balance and there’s no penalties if the balance drops below the minimum deposit amount (other than it doesn’t earn interest when the balance is below $2000).